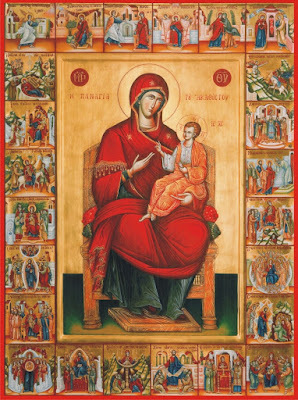 With the ancestral piety of our ancestors as a companion, who over the centuries were connected with God and the Mysteries of our Holy Church, but also harbored a deep respect for the person of the Most Holy Theotokos, we also approach her this evening with the wondrous Kontakion of the Akathist Hymn, which gives rest to all of our souls and animates it like heavenly rain. In our time in which we base everything on reason, no matter what we have, it will not give us the possibility to communicate with God. Not even our very sinful minds can approach the mystery of mysteries whose name is Theotokos. Only through the vehicle of faith and the inflammation of the heart can we offer the incense of our worship to the God worshiped as Trinity, as well as the required respect and our devotion to the person of the Panagia. Therefore let all the faithful, together with the Archangel Gabriel, approach the Virgin Mary and let us "embrace her", as Saint Romanos the Melodist says in a hymn to the miracle of her Annunciation. This is how the historian of the New Testament refers to her, when he describes the event of the visitation of the Archangel Gabriel to Nazareth in order to convey to the Theotokos the joyous message of the incarnation of the Son and Word of God. Her name is chosen by God. Saint Gregory Palamas interprets it as "Lady", based on the Hebrew etymology. She rules and dominates over all creatures, heavenly and earthly, as the Mother of God, which is why she has the perfection of power.2 The child of God Mariam has dominion over all creation, because she gave birth to "the God and Lord who created all", and she has the honor to be "the fiery throne of the Almighty" and "the seat of the King". 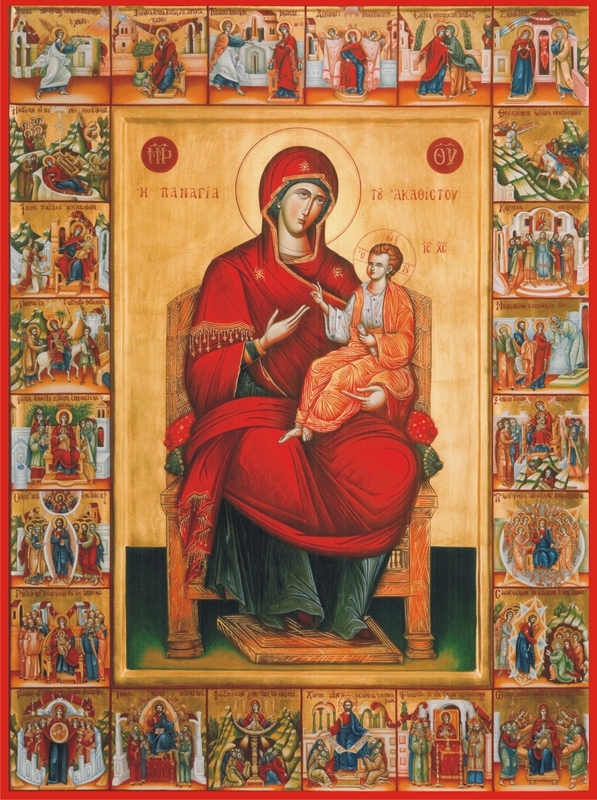 Saint Gregory the Wonderworker, Bishop of Neocaesarea, in analyzing the name of the Virgin, parallels it with the illumination which contains the perfection of wisdom, since the Theotokos is the brightness of the salvific and eternal light, as the word etymologically means "wisdom". Her name, still, according to Saint Nikodemos the Hagiorite, is composed of the initial letters of the names of five women of the Old Testament, whose gifts the Theotokos garnered to the highest degree, as they foreshadowed her. The first letter, "M", refers to the Prophetess Miriam, the sister of Moses, whom we encounter in the Book of Exodus and who possessed the special feature of being a prophetess, but also of chastity and virginity. The second letter, "A", refers to Asenath, the wife of Joseph the All-Comely, who also foreshadowed the Theotokos Full of Grace, since the all-comely Joseph is called according to the Fathers a type of Christ. Other interpreters say this letter refers to the prudent Abigail (1 Samuel), who saved her house from being slaughtered due to her prudence and humility. The third letter, "R", refers to Rebecca, the mother of Patriarch Jacob, who reminds us of modesty and exalted humility, both possessed by the Theotokos, who was overshadowed by the High God and became man in her immaculate womb to restore all of humanity. Although Rachel is also a type of the Theotokos, in regards to her beauty and the graces of her soul. The fourth letter, "I", presents us with a brave woman named Judith [which begins with an "I" in Greek (Ιουδίθ)], referred to in her homonymous book of the Old Testament, in which she is characterized by her bravery in taking the life of Holofernes by cutting off his head. The New Judith crushed with her immaculate Child the head of the noetic dragon and she shatters it every day helping those who use the most-longed for name of her Son as well as hers. On her, therefore, do we lean on today and send to her with a thousand mouths: "Rejoice, Bride Unwedded." At the same time we also ask her that in our time when joy is absent, that she will give us a little of it, since she gave us the source of joy - Christ. 2. Μοναχού Θεοκλήτου Διονυσιάτου, Μαρία η Μητέρα του Θεού, Θεσσαλονίκη 1988, σελ. 19. Όρα και Ἁγίου Νικοδήμου τοῦ Αγιορείτου, Κήπος χαρίτων, Ερμηνεία εις την Θ΄ Ωδή, Προλεγόμενα, Βενετία 1819, σελ. 170-171. 5. Saint Gregory Palamas, Homily 53, "On the Entrance Into the Holy of Holies." 6. Theotokarion, Tuesday Vespers, Ode 1, Plagal of the First Tone.